One of the most important tradeshows in Spain regarding business solutions is ExpoManagement. 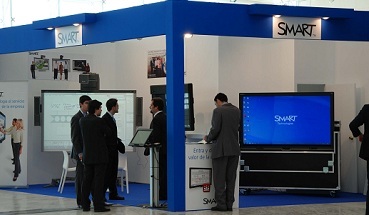 This year, Dubsar PR was there to provide its services to one of its clients: SMART Technologies. This Canadian company is very well-known in the education -it is the leader in providing collaborative solutions indeed- and it is paving the path as regards the business sector. Dubsar PR worked very hard to get some visits to SMART’s booth. Moreover, some journalists were pretty interested in knowing more and more about SMART Technologies and pay a lot of attention. This edition in ExpoManagement had a plethora of personalities talking about solutions for the companies or economics -quite usual topic nowadays-. Nouriel Roubini, Pau García-Milà, Philip Kotler or B.J. Fogg participated in the event by addressing such interesting speeches. More than 50 journalists were accredited to attend the tradeshow and the corridors were a sea faces. To sum up, two exiting days surrounded by people and working hard in our passion: public relations. ← Welcome to Dubsar’s new website! Dubsar full service, Digital Public Relations agency. We pride ourselves on offering dazzling results leveraging all the new communication tools while keeping the human perspective in our relations with customer, media and audiences. © 2012 Dubsar Spain All Rights reserved.